Sunset Hill Stoneware adapts thousands of designs into medallions to make our unique coffee mugs. However, the process of getting your art or logo onto our mugs isn't as simple as it seems. It requires both technical and creative knowledge that few have. Meet Liz Babicky. Currently our only graphic designer, Liz adapts your artwork so it can be placed onto a customized clay medallion for your mugs. Having worked at Sunset Hill for more than six years, she is intimately familiar with the work that our employees put into creating this high-quality product. 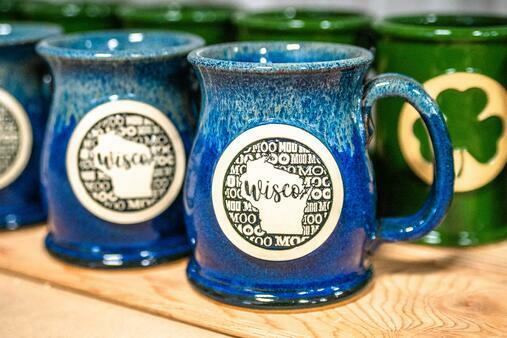 While most coffee mugs have printed designs, we use medallions to show off brands and artwork on our stoneware. These stand out more than traditional printed mugs and last a lot longer through the dishwasher. Thanks to Liz's graphic design prowess, we can turn everything from sleek and simple logos to detailed scenes of landmarks and houses into clay medallions that can potentially last a lifetime without wearing away. 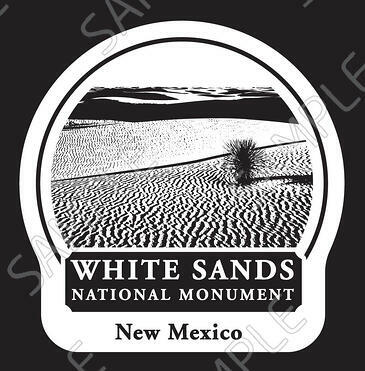 Each week, Liz creates about 100 artworks for medallions from photos, logos and other pieces our customers submit to us. She often creates even more than that each week during our busiest season ahead of the holidays. The easiest things for Liz to adapt into medallions are submitted in vector format. Unlike regular images, which get blurry when they're enlarged, the lines on vector images remain crisp and clean no matter how big or small they are. This makes it easy for Liz to adapt your medallion onto any of our mugs, from the tiny Average Jo to the gargantuan Kegger. Usually, when images aren't provided in vector format, Liz has to redraw them in that format herself so she can work with them. Even for someone as fast as she is, this can take a while. "Sometimes I can zip through a bunch, but sometimes I'm working on the same one for half an hour," Liz explained. "If I have to redraw it and am converting it to black and white or the customer wants me to come up with it from scratch, it can take an hour." Liz doesn't just redraw logos. As mentioned, she also often makes new designs altogether for use on our mugs. In fact, some of her favorite pieces are ones that were designed for Sunset Hill Stoneware originally. Originally commissioned by Bon-Ton, Liz created dozens of original designs that let residents in multiple states drink their morning brew in style. Some of these designs representing the Badger State, including our Sweet Home Wisconsin mug, can be found in our online store. Other states in the collection include Iowa, Illinois, Indiana and other designs just for the heartland. One of Liz's favorite parts of working at Sunset Hill Stoneware is being able to use her creative strengths to develop new artwork. This is especially true whenever an organization allows her to use creative freedom to make their mug medallions look even better. 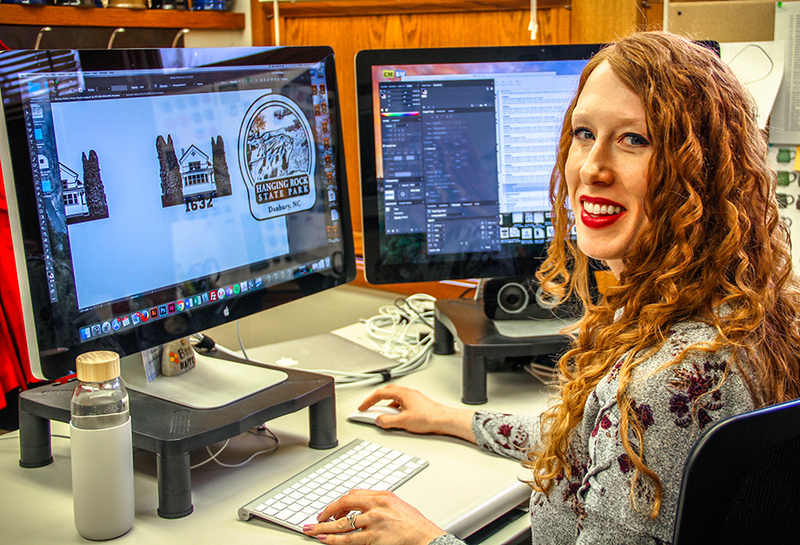 On top of creating custom mug medallions, Liz also creates art and graphics for our marketing department. As we've started to branch out more and more on Facebook, Instagram and our blog, you may have seen some of her pieces, which range from the whimsical to the realistic. "It's nice to be able to branch out and dip my toes into other areas of design," Liz said. 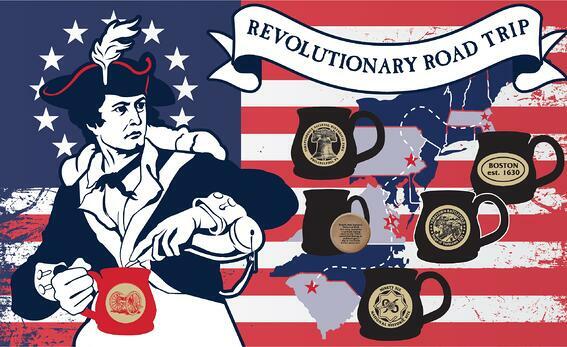 "I get to be a little more free with marketing graphics than I can be with the mug medallions sometimes." Many of Liz's graphic design elements can also be seen in our ads on Google, YouTube and other websites. Outside of her duties as our graphic designer, Liz is a jack of all trades in the craft world, doing everything from crocheting to making signboards for events and beyond. She also dabbles at hand-lettering and painting in addition to honing graphic design skills with wedding invitations and gifts for her friends. "I like to dabble in a little bit of everything and hop around," Liz said. Lately though, she's set her sights on home improvement projects as she turns her 19th-century farmhouse into a homesteader's paradise. She will also enter the world of beekeeping in Spring 2019, a goal she has had for a few years now. Having several friends and family members who manage their own hives, Liz's interest in raising bees grew as it became a more popular hobby within the past decade. "Once you dip your toe in that, you find someone who knows somebody who does it, and it gets you hyped about it because they're excited," Liz explained. "They only want to help. The beekeepers are just so passionate and they want to spread that." However, beekeeping protects one of the world's most productive pollinators and is good for plants—another major factor into Liz's decision to see what the buzz was about. "I'm a low-key environmentalist. I'm aware of my ecological footprint and I want to do something to give back," Liz said. "Bees just have their own little ecosystem and they're self-sufficient." Liz also wants to develop her own vegetable garden in addition to keeping bees. That's on top of the large, well-established apple orchard that stands on her property. Being full of creative aspirations and one of the most skilled graphic designers around, Sunset Hill Stoneware wouldn't be half of what it is without Liz's talents. Anyone looking to get mugs made can see what their logo or artwork would look like with one of her proofs, absolutely free.